Iran In the Space Race Launches a Powerful Rocket and Satellite ... Long Range Missiles Next? YouTube: A Simorgh rocket was launched from the Imam Khomeini National Space Center, Iran, on 27 July 2017. Iranian official sources state that the rocket has reached orbit. The most advanced rocket, the Simorgh which means Phoenix in Persian, that Iran has successfully launched a satellite on Thursday. The country reports that it is the most significant step for the aforementioned rocket. 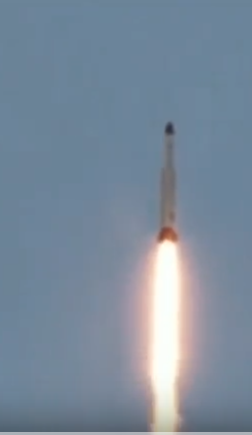 This is also a notable day for the Islamic Republic's beginner's steps into the space program. Iran had made announcements about major achievements that are difficult to independently verify. The Simorgh is capable of placing a satellite weighing u to 550 pounds or 250 kg in an orbit of 311 miles or 500 km. The U.S. and allies expressed concern with the same technology that can be used to create long-range missiles. Iran's satellite-launch program falls under the responsibility of the defense ministry, which has denied that the space program is a cover for weapons development. Photo taken from YouTube filmed event.